Last month I promised this month’s craft post would feature the coat I made during the Christmas holidays. The receptionist at my vet clinic calls it “a safe Cruella Deville coat.” And I guess it is. It was also a great way to use some of the fleece I had piling up on my supplies shelf. Fleece is addictive. 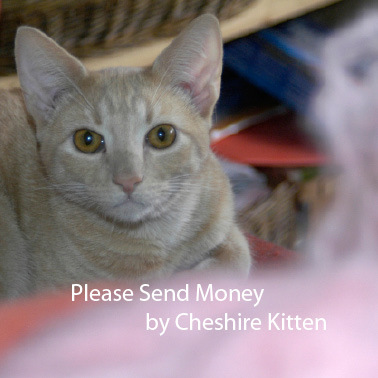 A couple of years ago I made some beds for Cheshire, Karma, the Cheeses….. All of the cats LOVE fleece. I don’t even have to make it into anything and they love it. I made some blankets in addition to the half dozen or so cat beds the pampered kitty people claimed for themselves. I bought a bunch more fleece remnants with the goal of making pet beds to sell to raise funds to help people get their cats spayed or neutered. While I have helped some people pay for the surgery and in the past year got one community cat neutered and two spayed before looking for their forever families (Zoe is still waiting…), hardly anyone has purchased the beds that I completed back in 2015. The people who bought the beds or won them as prizes in online fundraisers all had me donate the their beds to a shelter. This is good, of course, but it’s not much of an incentive to make more beds. Also, beds seem like they would be easy to sew, but they are awkward to finish with a home sewing machine once they are stuffed. I read an article about everyday household things that contribute to low-grade depression, and one of them was seeing supplies purchased for unfinished craft projects. I can’t find the article for a link, but reading it sparked me to take some actions around the house during my winter break from classes. I put some stuff away, threw away some no-longer-needed papers, and moved some stuff from one place to another (not sure how helpful that was, but it happened). 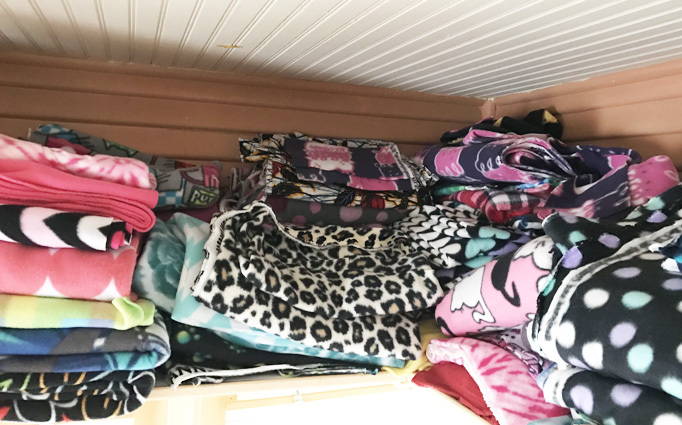 What to do with my small mountain of fleece pieces? I thought perhaps I could make some things for humans that could be sold to raise money for spay/neuter support. A web search for fleece clothing gave me the idea that pieced shirts and socks would work to use smaller lengths of fabrics. I found a pattern on Etsy for fleece socks and made a couple of pairs. The socks are warm, but they’re not that cute.. Then, I found one for sweatshirts for women and made a cute one for myself and one for a friend who is dealing with health challenges. I also bought a pattern for a little girl’s cape that I haven’t tried yet. It would also work great for a nursing cape for new moms. A cape would be pretty easy to cut and sew, and I might make some to donate to local organizations that support moms and babies. Maybe for next winter. While looking around on Etsy, I discovered the sweater coat. Sweater coats are something of a phenomenon. 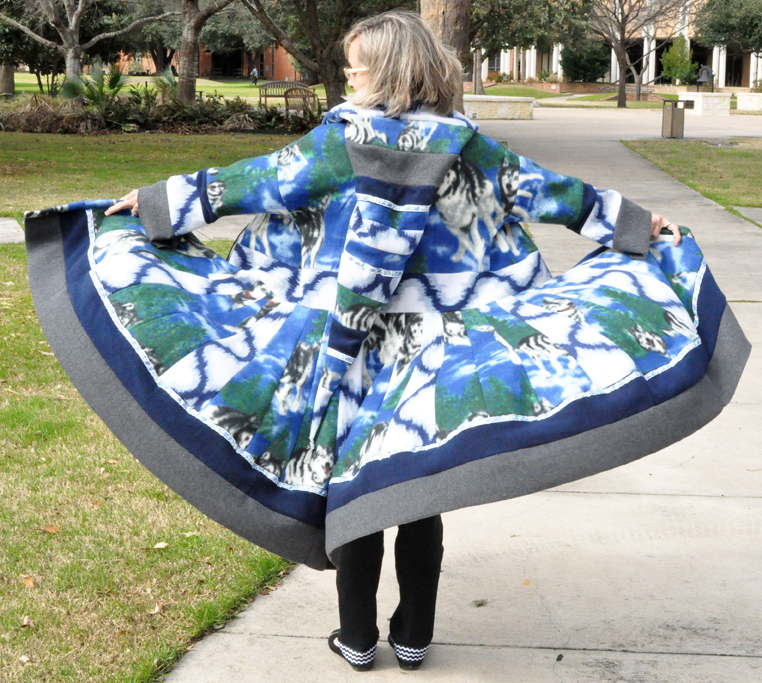 I bought a pattern from Etsy seller OnWillowLane to learn more about the coats and decided that fleece would work at least as well as cast-off sweaters to make interesting artsy coats. And I made one. This pattern comes with pieces to make a bodice and sleeves. The rest of the pieces I measured an cut. All of the seams are made with the zigzag stitch on the sewing machine, so they take a long time to sew. The zigzag does give the coat a shabby chic feel. What I’m getting at is that this coat wouldn’t make a great first sewing project. 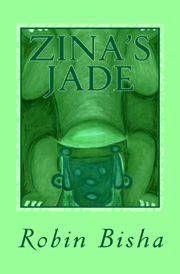 It is great for a confident sewer. 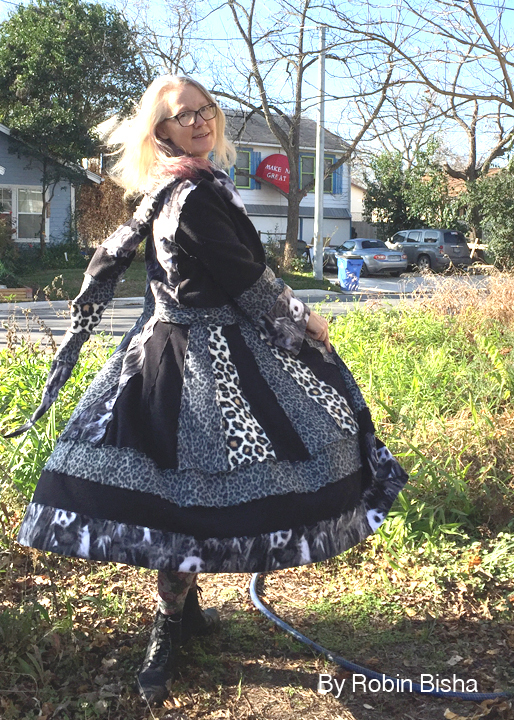 After I finished my coat, I discovered the originator of the pixie sweater coat is a designer who goes by Katwise on Etsy. She must have upcycled a million sweaters. Coats from Katwise, however, sell within minutes and for up to $899! 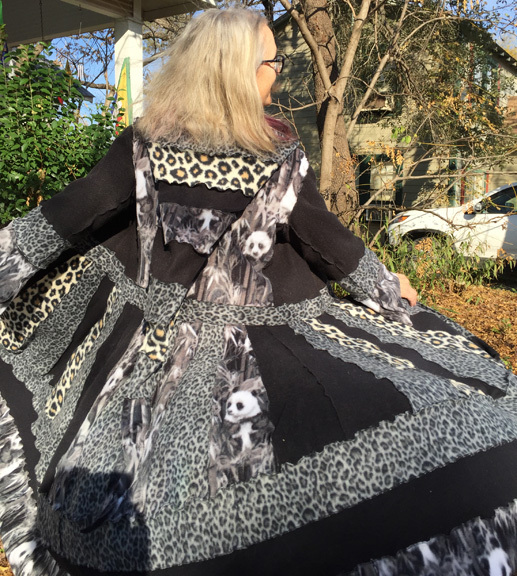 My coat took about 12 hours to make — and I listened to an audiobook while I worked — so this could be THE item to make to raise money to support spay/neuter. But then I noticed lots of people have similar coats for sale on Etsy, and none of them, no matter how gorgeous, sell like coats from Katwise. 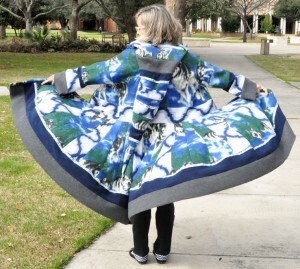 In fact, some of the coats that were available in December are still languishing in the listings of Etsy shops today. 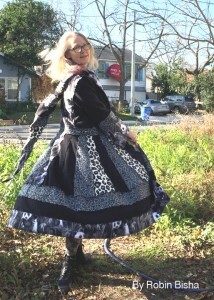 Although my dreams of making thousands over night for spay/neuter were shattered, I had FUN making my coat. I have fun wearing it too. I made another one on a winter dog theme and donated it to Friends of Paws in Prison for them to use in a fundraiser. The print features Alaskan malamutes in the snow and there’s a Sterling silver charm of one on the hood. I didn’t use the zigzag stitching and added some ribbon for a different look. I wasn’t thrilled with the bodice in the pattern I bought. Katwise uses the actual bodice from a cast-off sweater. I thought about buying a blue hoodie but decided that wouldn’t give me the look I was going for. I made the bodice for the second coat from another pattern I have. Friends of Paws in Prison will be raffling the coat as part of their annual Dog Art event on March 4. Check the Facebook event page for details about the event and raffle, or call Thunderpaws Canine Solutions for more information about how to buy tickets. You don’t have to live here in Seguin, Texas, to buy tickets and maybe win the coat while supporting dogs and women in a prison training program. I’m working on anther one in black, white, and yellow. 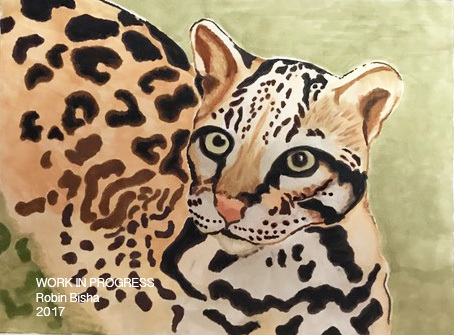 Next month I’ll tell you about a project I’m working on that will feature endangered animals of Texas on banners outside and, I hope, help make a comfy, safe space for the Garden Kitties. 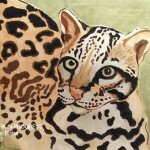 Fifty or so ocelots live in Texas. This is the first animal image I’m working on for my project. they may not go for thousands, but what they do raise will be much appreciated. You are so very talented. Is there anything that you can’t do? That is meant as a compliment. Thank you! My mom taught me to sew and knit when I was a kid. It was useful for making cooler clothes than I could afford otherwise. I like to try new things and sometimes discover that I can do them!